Two dozen years ago we moved to what has since been christened~ Clay and Limestone Garden. Long time readers know that the relationship between garden and gardener has been a passionate affair...filled with moments of deep love and equally deep despair. Even in the face of over whelming evidence that wildflowers naturally occurred and thrived here, I tried to create an English cottage garden, a Mediterranean garden and a New England woodland. They were failures and sorely tried my patience! In my haste to create these idealized dream gardens ...I had over looked the abundant native x-asters, columbines, trout lilies, trilliums, mayapples, downy woodmint, penstemons, dicentras and a host of other beauties that grew here~~ naturally. It was a wonderful day when I stumbled upon Thomas Hemmerly's Wildflowers Of The Central South. I've never had the honor of meeting Dr Hemmerly, but, he became my garden mentor for understanding and appreciating the special native plants that grow in Middle Tennessee. He introduced me to our soil, micro-climate adaptations, Ordovician limestone and the stark beauty of a cedar glade. indigenous wildflowers, naturalized flowers like Queen Anne's Lace and carefully chosen exotics/introduced species. Wildflower Wednesday started out as a regular post to celebrate the wildflowers in my garden. It's been a fun way to introduce you to my soul mates! I treasure them and love sharing them. They grow with ease if planted in the right spot and they draw native fauna, like bees, birds and butterflies to the garden. There are articles all over the Internet extolling their virtues. You've read many, I'm sure! Here's how I sum it up~Native wildflowers are good for the earth and good for its inhabitants. Wildflower Wednesday is about sharing wildflowers/natives/naturally occurring plants no matter where you garden~the UK, tropical Florida, Europe, Australia, Africa, South America, India or the coldest reaches of Canada. It doesn't matter if we sometimes show the same plants. How they grow and thrive in your garden is what matters most. Everett Butts, a native plant old timer living in the foothills of the Sierra, east of Sacramento, puts it this way: "What nature is doing on its own I'm doing with it. I tell people I have an affair with the land going here. It's damned important to me. It's part of my substance, my living and breathing. What I feel here is the earth and what flies and walks over it and burrows under it. The more I see and feel and understand, the more I like it." 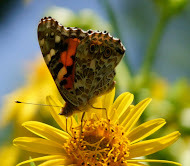 Love your wildflower pictures, and the story of how you came to appreciate and love them! Ijust love wildflowers and have quite a few. I will try in the coming warmer months to participate. It won't be as long as it has been and I am looking forward to the growing season. A lovely story about your garden and the developments. I guess we all go on journeys with our gardens but the good thing is we are always learning and always have lots to enjoy with nature. Sometimes it takes a little while for us to understand what Mother Nature wants from us. I am so glad you have embraced your ability to grow some spectacular wildflowers. In turn you have shared your knowledge with all of us and for that we greatly appreciate all you do. The truimph of victory and the agony of defeat..you have done well by your gardens in learning what will thrive in your conditions. How's the thumb? I'll be joining in as soon as I have something to share, probably next month. Spring seems agonizingly slow in its arrival and of course most of the plants are waiting for it to get here! I'm over these cold below normal temps. This post reminds me of something we talked about in my Master Gardeners' class yesterday. We were studying insects, mostly garden pests, and it became evident that one way to avoid so many destructive pests is to plant natives. They have built-in defenses for local pests, so it's another plus to them. 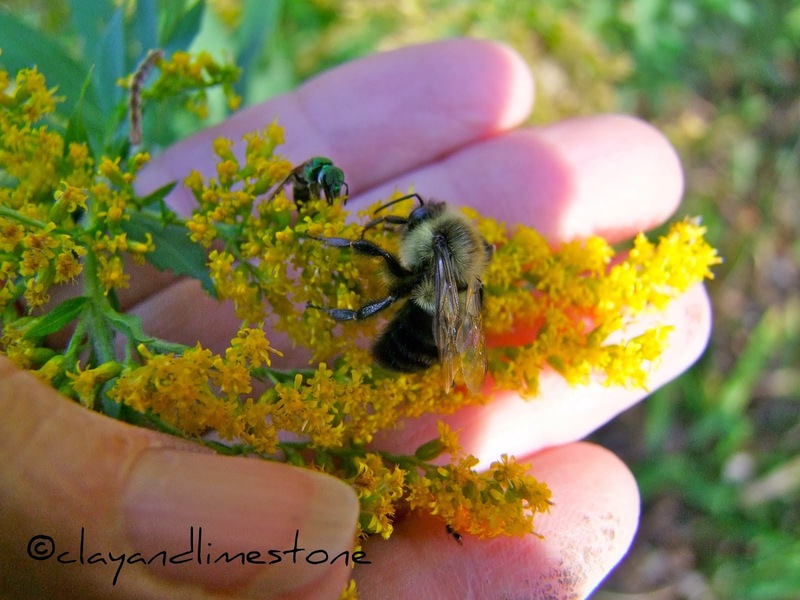 Besides, the pollinators usually love them, as evidenced by all the happy bees in your garden! That's why I love native plants--you know they will grow for you because they are suited to your particular conditions. It's funny though, the list of wildflowers you mention being in your garden naturally are very desired and hard to find here (unless you know the right people, LOL, which, vaguely, I do). I guess it's kind of like curly-haired people wanting straight hair and vice versa. It's nice when you accept and love what you have! My own garden is a combination of natives and non, and a lot of woodies, which I was never interested in in the beginning and now love. Two dozen years is a deep relationship and you tell the tale so well, Gail...of course it doesn't hurt that many of your natives are dependable plants that would be beautiful anywhere! What a beautiful post Gail. There are so many wonderful natives aren't there? And they perform so gloriously in your garden! I will have to find Hemmerly's book, even if the habitat in my garden is different from yours. What a wonderful post! For someone like me, relatively new to your lovely blog, it really helped to clarify what you're about and your growing conditions. Hello again Gail! You are such a wonderful writer and I enjoyed your journey to native plants. I too have come to love native plants. Finally it is catching on here. Most every nursery here carries a variety, and we begin to see more and more in gardens. I love trying to think of the native I'm going to focus on and will probably start thinking right away about the one for next month. AT first I too hated my clay, but after some research, I knew it was actually considered to be pretty good soil nutient wise--I and the plants just had to get to it. I have loved the challenge of finding native plants that like clay, and I find their beauty to be superior to most non-native flowers--especailly when that beauty is subtle and sublime, as I think the Midwest is (I know you aren't techincally inthe Midwest, but, I mean, all teh palcces we gloss over or fly over so easily). Gail, it is so in our natures as gardeners to try to change things to suit us. And it is a lesson in compatibility to learn to change ourselves to what nature intended. You have made that change, and there is such beauty in your garden. It is a treat each time I see more photos. Gail, your garden is a testament to working with nature, rather than trying to change the natural growing conditions of your environment. I love the ending quote! And I share your passion for wildflowers and for learning to work with the plants and ecosystems of the place you are. I look forward to the wildflowers blooming here this year and joining in the meme! Beautiful! And you're so right, the plants that evolved for the land are the right choices. The Texas Hill Country is also a land of one-inch-of-clay-over-limestone. It takes a pickaxe to dig a 4" hole here. But more unique species have evolved to live in the Hill Country than in any other part of Texas. And given the size of the state, that's impressive. Our native gardens are the reason we've seen/heard 86 species of birds at home. Hello Gail, Your post is delightful. It seems that in those early years we revel in attempts to change the things/people we love because we're sure a good thing needs improvement. As we mature it becomes evident that what attracted us in the first place is still there for our enjoyment if we're willing to let go of our idealistic notions. A great metaphor for the garden and the marriage. I admire your diligence and longevity, your ability to "bloom where you're planted." What a lovely post, Gail. I could certainly identify with your desire to create various gardens not suited to your area. You have such a beautiful array of wildflowers to work with. Your photographs show them off wonderfully. Gail - a great story about your inspiration and passion for wildflowers. You rock the wildflowers Gail. I'm glad you finally came to terms with your garden and let them rule. You've educated so many of us by doing that. What a wonderful reflection to read about your journey as a gardener! I do think successful gardeners generally come about to understanding the interaction between where they're gardening and the plants that thrive there -- and the magic that happens when plants flourish. A lovely post, and inspiration for some upcoming presentations. Gail, it's awesome seeing the growth in popularity of native gardening. You've certainly distinguished yourself among garden bloggers as one of the biggest proponents of natives in the garden, and I'm just one of many who have been inspired to add more natives thanks to you. I'm so looking forward to seeing the PPPP, Penstemon X, and Senecio aureus you shared with me last year come back, and hopefully bloom this year. I noticed that someone was sending a lot of weird comments on your blog. I'm sorry about that! I have to approve comments that are older than whatever the number is. I reject several spam comments a week from different anonymous people. I enjoyed this post. I need to educate myself more about which of my plants are native. I sometimes find out after having grown something awhile that it is native. I do try to get plants that have a butterfly or bird on the tag indicating they like them. I'll need to be more thrifty with my plant selections this year, due to our kitchen remodel. That's OK, though. I plant to do a lot of dividing and rearranging. Plus, I have been planting lots of things over the last few years. Maybe I'll have something to post in a month. last few days our class held a similar discussion about this subject and you show something we haven't covered yet, thanks. Hi again Gail, i posted my wildflowers today coz i thought now is the 4th Wed of the month, have been waiting for your meme to come up, then just realized to look at the dates under the photomeme. Hehehe! Love your history lesson and your photos. Sorry I missed Wildflower Wednesday. Super Storm Sandy took power away from us for a few days ... thankfully no damage. Looking forward to participating in the future. such a perfect way of writing? I have a presentation subsequent week, and I am at the search for such info.